This article is 1951 days old. The station has declared this December 22nd as Joe Strummer Day, and will hold a 24 hour marathon kicking off at midnight. Sunday marks the 11th anniversary of his death, and musicians and activists to join the station for a day-long broadcast that is believed will have both local and international audiences in a bid to confront poverty in Windsor and Detroit. 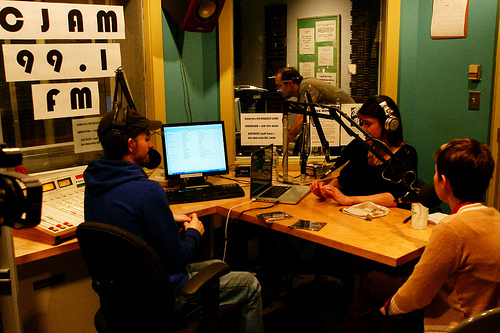 Local listeners can tune in to CJAM at 99.1FM live broadcast, while www.cjam.ca provides a global live stream and access to exclusive content. Leading up to and during the event CJAM will be live on Facebook (www.facebook.com/JSDCJAM) and Twitter (@CJAMFM). CJAM is also conducting a canned-food drive in the lobby of CJAM to support Street Help. Street Help is a volunteer organization helping the homeless downtown Windsor. They are food bank and daily soup kitchen. They serve hundreds of cups of coffee a day to those in need. Throughout December, you can bring in non-perishable food items to CJAM’s lobby, like peanut butter, cereal, pasta, crackers, canned fruits and vegetables, and soups. Street Help is also looking for foods with peel-back tops to give out to those who do not have can openers.